It’s a story we all know. A child, the last hope of a doomed civilization, is sent to a strange new land where he must discover his true heritage and his true potential. The child grows into a hero, a leader, a testament to the glorious future that awaits him. For most of us, this would describe the Superman story; that child is Kal-El from the doomed planet Krypton, and the strange new land he arrives in is Kansas, where he would learn to balance his double life as the bumbling reporter Clark Kent and as the first and finest superhero ever to be immortalized in the thin pages of a comic book. But, for as well-known as Superman is today, there is a whole side of Superman that has remained hidden. Superman is, in fact, amongst the ranks of the great Jewish mythic heroes: Abraham, King David, and, of course, his own direct biblical foil: Moses. The story of Kal-El, a name which when translated from Hebrew means “vessel of God”, is one of the great stories that shows the implicit value in a character whose roots are definitively Jewish, and who demonstrates the value and relevance of a nearly four-thousand-year old religion in modern times. In Cleveland, Ohio in 1938, two sons of Jewish refugees published Action Comics #1: the first appearance of the Man of Steel. Those two sons were Jerry Siegel and Joe Shuster, who, ostracized for their Jewish identities, turned to the world of fiction to make sense of a world that seemed turned on its head. They devised the perfect allegorical character to express their feelings of fading identity, desire to connect to their roots, and their need to protect themselves from the seemingly unstoppable tide of mounting anti-Semitism four thousand miles away in Germany. In the 20th century, Siegel, Shuster, and thousands of American Jews faced a full blown identity crisis; removed from their homelands, thousands of miles away from the hearth of their traditions, American Jews faced the prospect of leaving their traditional lifestyles and Judaism behind and adopting a totally new, increasingly secularized American identity. Siegel and Shuster incorporated this struggle into the Superman character through the endless highwire act of Kal-El balancing his lives as Clark Kent and as Superman. The awkward all-American farmer from Kansas represented the new Jewish-American life. Clark Kent has the perfectly unassuming nature that comes naturally with perception of being just an average American with nothing to hide. His graceless disposition has less to do with genuine clumsiness than it does with the fact that when people are looking up in the sky for a bird, a plane, or Superman, the last place they would turn to check is the cubicle of one Clark Kent. With seemingly no exceptional qualities and no unordinary features, Clark hides all traces of his true heritage behind one pair of thick black rimmed glasses. 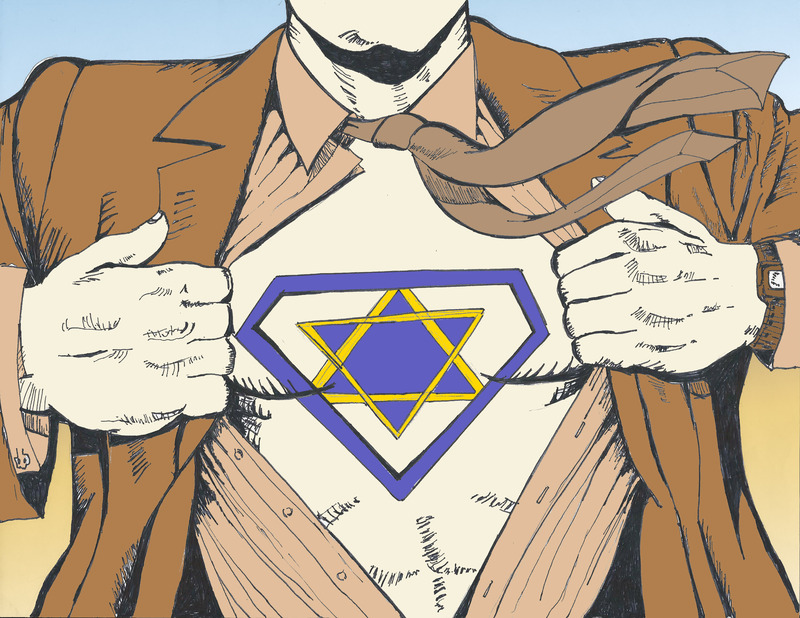 Where Clark hides his superpowers, American Jews were hiding their Judaism. The true nature of their heritage was always there under the surface, waiting to be exposed like ripping open the front of a button down shirt to reveal their ancient legacy beneath, but for reasons of convenience, fear, and necessity the secret remained hidden, confined only to phone booths, alleyways, and other out of sight places. When crafting Superman’s backstory, Siegel and Shuster made overt connections to the story of Moses. The two have nearly identical backstories: lone child, last hope, doomed civilization, heroic revelation, virtuous leader, inspiration for a nation. Siegel and Shuster, like myriads of Jewish writers before them, felt the reverberations of the Bible in their art. Superman’s connections to Moses are no coincidence, by connecting him to the Bible’s most mythic leader, Siegel and Shuster tacitly packed Superman full of Moses’ best qualities. Dedication, compassion, bravery, charisma, hope; all the qualities that have led Moses to be one of the Bible’s most enduring heroes are the same qualities that have made Superman the most enduring superhero. While conjuring up the character of Superman, Siegel and Shuster were acutely aware of the putrid anti-Semitic climate infesting the globe. Superman made his debut in 1938; the Nazis already had a firm grip on Germany, and just a little over a year later Hitler would order the invasion of Poland and World War II would be officially underway. It is in this political climate that Siegel and Shuster captured the most brilliant and abstract Jewish imagining of Superman: as a reinvention of the classic folk tale of the Golem of Prague. In the 16th century in the Holy Roman Empire, the Jews of Prague faced expulsion, pogroms, and the constant looming threat of death. To protect the Prague Ghetto from decimation and murder, Rabbi Loew ben Bezazel crafted an enormous guardian out of clay, blessed him with life through ancient rituals and incantations, and produced a champion to protect his community. Superman is a symbolic revitalization of this story. Unlike the Golem, Superman has only ever existed in a fictional context, but his protection is no less important. Here is a Jewish champion who cannot be shot or killed, who cannot be forced to submit to exile, who is a defender of all of the innocent, and who is an eternal guard against the will of evil. When Siegel and Shuster published Action Comics #1, Nazi Reich Minister of Propaganda Joseph Goebbels released a statement in the weekly SS newspaper, Das Schwarze Korps, decrying Superman as a Jew and condemning his Jewish creators. The Nazis saw the new golem; ink on a page with life breathed into it in an apartment in Cleveland. A new champion for a new time. In addition to his historical context, Superman also embodies Judaism in the traits he reveres. He emblematizes all of the best lessons of the Bible. What took Cain & Abel, Jacob & Esau, and Judah & Joseph generations to understand – compassion and forgiveness – Superman embodies in all of his endeavors. Superman is the most ardent follower of the Jewish concept of Tikkun Olam, a principle which means literally “to repair the world”, and which emphasizes that Jews are not only responsible for the welfare of other Jews, but for the welfare of people everywhere. All of Superman’s actions, from his feats of grandeur, catching falling planes and throwing doomsday meteorites out of Earth’s trajectory, to his small acts of love and kindness, rescuing cats out of trees and being there to listen to someone having a bad day evoke the qualities that make Judaism an enduring and beautiful religion. At its core, Judaism is about doing all the good, not just the most good. It all matters; all debates of justice, all moments of compassion, they are equally important puzzle pieces in the mosaic that illuminates why life is worth living. In a world where superhero movies dominate the box office and the small screen, why has Superman remained a head above the rest? Why, after more than 75 years, does the image of a red “S” on a field of yellow still inspire millions of people across the world? Superman didn’t have to get bitten by a radioactive spider, or watch his parents die in an alley, or get struck by a bolt of lightning to know the importance of doing the right thing. Superman does the right thing because it is the right thing to do. Superman endures because he represents the potential in all of us to be capable of great acts of kindness and great acts of love. Superman shows us that in the face of adversity, in the face of losing one’s culture, in the face of seemingly unbeatable odds: compassion and love are still worthy. Tikkun Olam is still worthy. It’s a story we all know. A child, the last hope of a doomed civilization is sent to a strange new land where he must discover his true heritage and his true potential. It is the story of Superman, and it is also much more.